Can anyone find this building? The city isn't looking so big now that we can understand better where in the map the locations that are shown in the trailer are supposedly placed. I looked for it earlier but couldn't find it. I searched at the south of Downtown and around Koreatown, Westlake and Wilshire. I'll do a better search tomorrow but it's somewhere around for sure. Great thread, nice to be away from all the number conspiracies. Rockstar wouldn't be accurate to put mist where there's no water. There's no water surrounded by moutains in California: the only exception is the Bay Area. Now look. You clearly see that there's a valley, mountains, and MIST. There's no mist without water. My conclusion: a valley, filled with mist, surrounded by mountains = The Bay Area. There are 3 wind farms in California: Palm Springs (about 100 miles east of Los Angeles), Tehachapi (between San Francisco and Los Angeles - close to Bakersfield) and Altamont, about 20 miles east of The Bay. A wind farm with mist and mountains, to me, there's no doubt: this is the Altamont wind farm and the bay is behind, because there's absolutly no water at Palm Springs wind farm and close to the Tehachapi wind farm. The Altamont Wind Farm is just right next to hills very similar to the ones in the trailer, so they match up. But it looks like it almost could be the post for the New Bay Bridge. The horizontal beams get less spaced out the higher up it is on both the unknown object and the bridge. the only thing that doesn't match up is the posts on the bridge are inbetween the roads, while the object looks far to wide for it to be the same - unless it was changed so that the posts where put on the outsides of the road. So what do you guys think, is that the bridge to the bay area, or something else? I think you could be right. That bridge looks pretty awesome. Went on holiday once to LA in 2003, sorry my memory ain't good enough to be helpful. Just wanted to call in and say this was a top thread though, keep up the good work! Absolute excellent effort on the thread. Just want to say THANK YOU. this is the best thread i've ever read on ANY site. Awesome, there's now 37 locations on the Gmap, and I think I missed a couple from earlier too. @polvofiloso - I think you're right, it seems to be a cross between the Versace and Breguet buildings. Okay, Hopefully someone finds out about it soon! 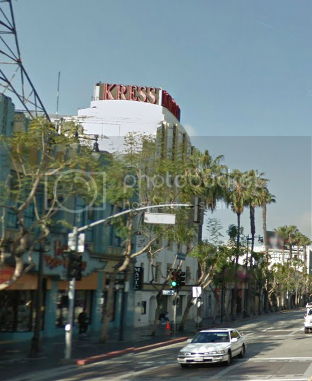 Gifbrah said that these two buildings were the Popeye's on Hollywood Blvd and the Kress Nightclub. I completely agree on Kress, but Popeye's seems a bit off - the tower is too big, it's slanted on the top and it's further away from the road (meaning when you look that way you can't really see it). 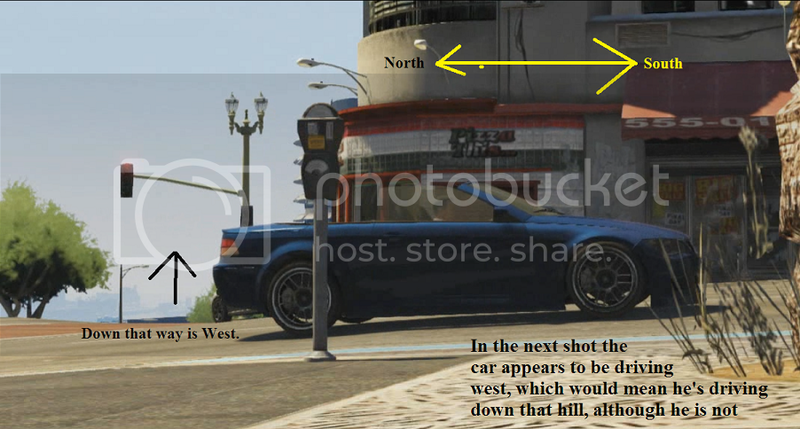 But then again R* could have just exaggerated their tower ( ). Was probably modeled some time before it closed. 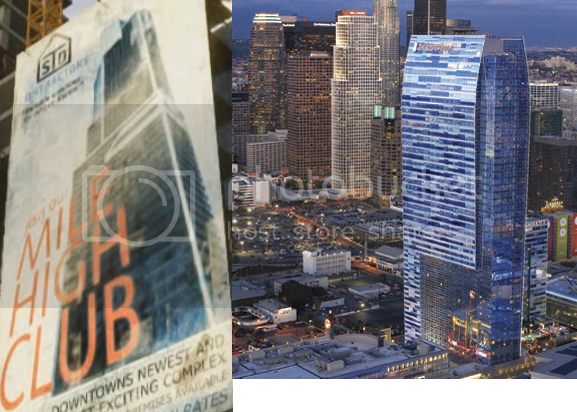 Mile High Club = La Live RitzCarlton/Marriott Hotel?? Sorry if this was posted. Hey guys, my computer is having issues, but I haven't forgotten about you. Fido, you may want to update your map. If you look at this screenshot, the observatory is further to the right than your map depicts. (Look in between the pump). I have troubles to see Kress and Popeye's in this screenshot. If someone could enlighten me. 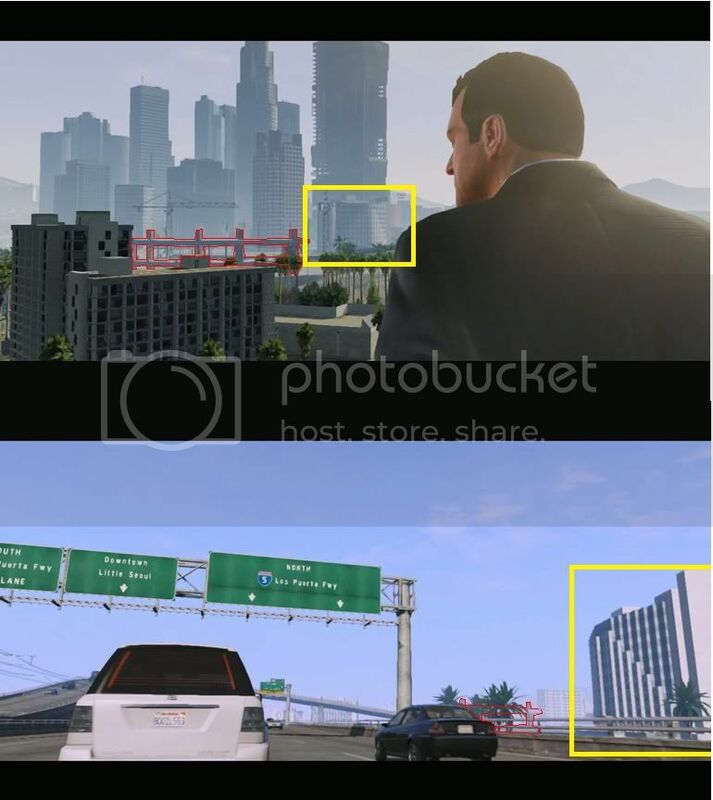 About the LA Live/Ritz Carlton Hotel, I believe R* was inspired by it but I think they made a design of their own. This building is one of the latest addition to the Los Angeles skyline so it's coherent with the construction site in LS. However, the architecture is different. @Gifbrah : I believe you're right. The observatory may be more to the north. Maybe somewhere above Sunset Blvd or Vinewood Blvd (let's say between city national Bank and Capitol records?). I'll modify my map but won't bother reposting it just yet. I'll wait for further discoveries. I don't want to flood the pages with it. About the bridge in the wind farm section, it may a bridge (and it looks quite like the New Bay Bridge) but it may also be something else (power line, TV tower...). I don't think we can be sure right now so I'm gonna "forget" about it for now. Plus, to be honest, since this bridge is still under construction (2013 opening), I don't believe this is it. It's just my opinion and I think we won't see SF and LV in this game. I believe what R* said and the game will be set in LS only and its surrounding areas. I actually believe the city itself will be about the same size as Liberty City but that we will get a huge part of countryside around it, hence the "biggest game ever from R*". Now back to the search for the freeway building ! I edited the quotes to normal text because the forum had some problems with the quotes. Updated google maps with the different windfarm and some of the buildings from Gifbrah, but will wait for a Fido just to make sure of the other Popeye's and whatnot. 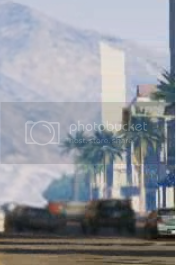 Also interesting about BoolCaX's picture is that in the real picture you're looking southeast and in the trailer you're looking west towards the sunset, so it seems that R* have moved the highway below, and east, the cluster of towers. Anyone recognize a similar symbol for a jewelry store, most likely on Rodeo Drive? I think I found it--kinda. Southeast corner of North Rodeo and Dayton Way. There's a narrow pedestrian mall that loops off of Rodeo. The store at the intersection of that walkway, Rodeo, and Dayton, is the store to the left of the jewelry store in the trailer. Its a dead-ringer, no question about it. But where the jewelry store in the trailer is, to the right of the store on the corner, is harder to make out on the Google street-view, as google won't take you up that pedestrian pathway. From a distance it looks close, although the dark brownish colors of the columns are not a match. But they took license with making that a drivae-able street, so perhaps they changed a few other things up too. But the white store on the corner with the round window canopies is a lock. Edit: Did a little more digging and the pedestrian mall is called Via Rodeo. The white building on the corner is called "Breguet". There are two possibilities for the jewelry store heist store. The store right next to Breguet is similar, but the colors of the columns is wrong. Further in Via Rodeo, there is a large Versace building at the middle, and the next store down (on the same side of the street as Brequet) is also a possibility. 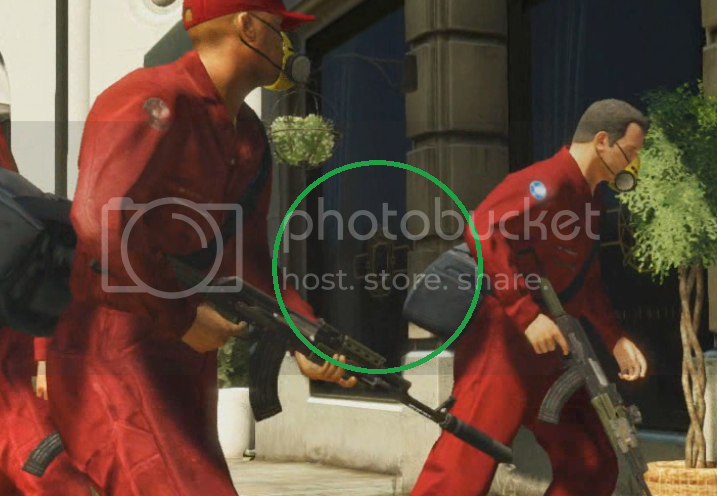 The actual store of the heist may be an amalgamation of several stores in that small area. Also the wikia article needs to be updated about the robbery thing. They still have listed it as bank robbery. But the jewelry store they are robbing in that scene has a real life counterpart -> the "David Orgell" store (http://www.davidorgell.com/aboutus.aspx) in Two Rodeo Drive, right next to the "Breguet" store (http://www.breguet.com/de/Los-Angeles), that you also can see in that scene. The "In-Game" logo of that store is different (it can be seen on the windows of the store). It is gold colored and outlined in shape of a ring with a big diamond on it. Below the logo there is a text that says something like "Fine Jewelry". It could be some other Text though, because i canceled the analysis of this text last night. It just wasn't interesting enough and i needed to sleep. The color of the "David Orgell" store's sunblinds (couldn't find the right english word for it, sorry) you see on the website is blue, but in real life they were also colored dark/brown once in time (for example like here: http://www.2rodeo.com/), like they can be seen in the trailer. A map of that two stores is here: http://www.rodeodrive-bh.com/map.html (just click on "pop out", the lower right corner, "Two Rodeo" Map). So, i'm 100% sure, that this store they are robbing is the counterpart of the real life "David Orgell" store. It's hard to get any similar shot of Kress because of the palm trees, but it does have the same sort of staggered top to it. Second part makes sense, should I and it too the google map, or do you guys even care about that? Lastly, the main reason why I started looking into Bay Area connections is because I didn't know what that white structure was in the wind farm scene - and I still don't know what it is (kinda doubt its a bridge at all, and don't think it is the bridge to San Fierro), just a weird thing I'm trying to figure out what it is. @[enforcA] - Good call on that, looks right on. 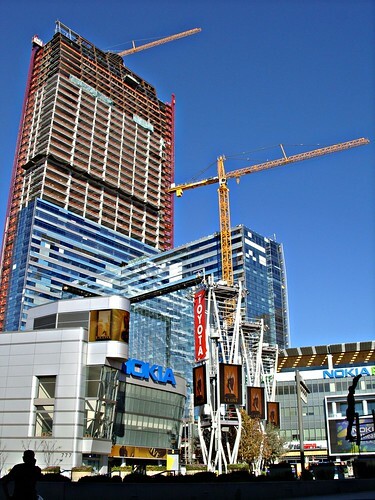 The centerpiece of the district is a 54-story, 1,001 room two-hotel hybrid tower, constructed above the parking lot directly north of the Staples Center. Built by Webcor Builders, the skyscraper contains both an 879-room JW Marriott hotel on floors four through 21 and a 123-room Ritz-Carlton hotel on floors 22 through 26. Floors 27 through 52 hold 224 Residences at the Ritz Carlton condominiums. Groundbreaking for the structure took place in June 2007. The project was completed in the first quarter of 2010.
and a 123-room Ritz-Carlton hotel on floors 22 through 26. Floors 27 through 52 hold 224 Residences at the Ritz Carlton condominiums. Groundbreaking for the structure took place in June 2007. The project was completed in the first quarter of 2010. Yeah, i would say 2008 as "near-to-exact" reference point, since they started with building in 2007, because the Google-Map Streetview pictures of "©2009" show the building about 60% (and up) done and the building progress in the trailer was below this (below 40% i would say). f*ck me you guys are better than CSI and NASA combined! best thread on this whole forum period. rockstar's ever released" will only have one city and countryside. The new Los Santos doesn't seem to be much bigger than SA version.